There are few times in sports where we can use the phrase, “the greatest ever.” This might be the best way to describe Allison Feaster, however, who is regarded as the best women’s basketball player to ever play in the Ivy League. The accolades seem never ending for the point guard, who is a three-time Ivy League Player of the Year (1996, 1997, 1998) and four-time First Team All-Ivy selection (1994-1998). 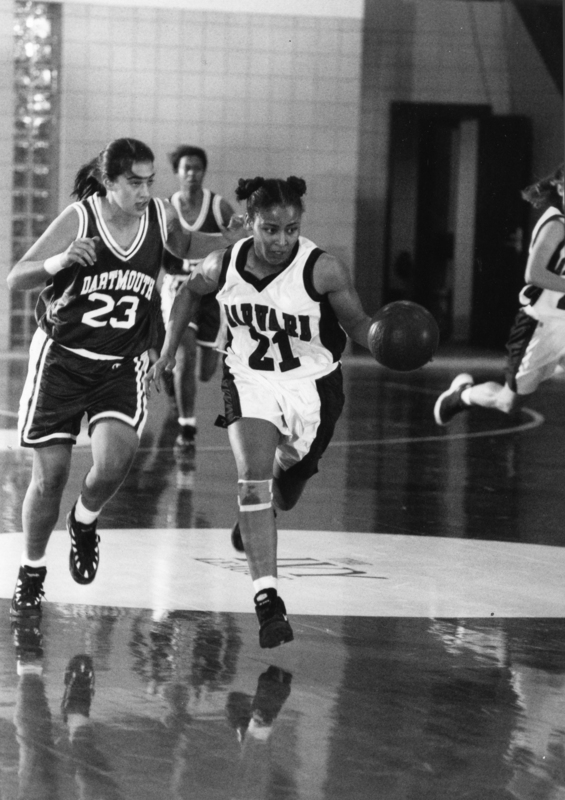 Allison was also tabbed the Ivy League Rookie of the Year in 1995. Allison set numerous records at Harvard—she is first in career points (2,312), career rebounds (1,157), offensive rebounds (440), steals (290), field goals made (771), and free throws made (475). She’s also left her footprint in the Ivy League record books. Allison was named Ivy League Player of the Week 21 times in her career. She is second all-time in points, third in rebounds, and third in steals. Allison helped lead the Crimson to Ivy League titles in 1996, 1997, and 1998. Her senior year, she led the nation in scoring. At the 1998 NCAA tournament, Allison and her teammates pulled off arguably the greatest upset in NCAA basketball history when the sixteenth-seeded Harvard beat the top-seeded Stanford in the first round of the tournament, 71-67. The feat is still the only time a sixteen-seed has upset a one-seed in both men’s and women’s NCAA basketball tournament history. The four-year letterwinner was the 1998 Radcliffe Prize Recipient, awarded to the best female senior student-athlete. After graduation, Allison was drafted by the Los Angeles Sparks in the first round (fifth overall). She played in the WNBA for ten years and currently plays professionally in Europe. I would like to thank the Harvard Varsity Club and the Selection Committee for this tremendous honor, and I accept it on behalf of the many teammates, family members, and friends who supported me and enabled me to live my dream. My Harvard experience was built upon the sacrifices and hard work of many, and this Hall of Fame Induction is their tribute. My Harvard experience began long before my mother Sandra and high-school basketball coaches Sue Misenheimer and Pamela Williams dropped me off in Harvard Square, wearing an oversized Duke sweatshirt and baseball cap. I can still recall the reverberations of fear rumbling in my gut as their minivan pulled away leaving me in what my mother always said was the land of opportunity; all I knew was that I would be hours removed from my comfort zone and months away from seeing my sweetheart, Danny. My Harvard experience even predates the recruiting letters and torturous weekly phone calls that the coaching staff had to endure because I was not the most socially outgoing person during my high school years. It predates Kathy’s home visit to rural Chester, S.C., where I can recall my initial impression of this confident woman with fashionable jewelry whose aura I would one day evoke as I attempted to convince my husband to hyphenate his last name to become Mr. Feaster-Strong (I was unsuccessful)! My Harvard experience began on the dirt roads of Carlisle, South Carolina, where my great-grandparents, Bessie and Preston Feaster, spoke often about the importance of education while my siblings and I would shoot hoops on the home-made backboard and wire rim nailed to the walnut tree that still yields fruitfully to this day. My parents would cultivate the seeds that my great-grandparents had planted. My mother, my role model, first convinced me that I could succeed at anything if I gave my best, and she was a great example as she worked, under less than perfect conditions, to raise four children on her own. I truly appreciate the sacrifices she made in the face of extreme adversity in order for me to attend Harvard, and I am thankful that she nurtured my love and talent for basketball. Although one of the most memorable moments of my Harvard experience coincides with our victory over Stanford in 1998’s NCAA tournament, my experience would not be complete without the many seemingly insignificant moments shared with my Harvard Basketball teammates. These moments would include the time when Megan Basil and I decided to skip our very first game-day shooting practice as freshmen because we, unaware that these practices were mandatory, preferred to sleep in rather than make the trek across the river early on a Saturday morning. These moments would include the millions of times that Amy Reinhard or Buzz Proudfit would hear me say “I miss Danny” throughout the year and, more importantly, when teammate Jessica Gelman, in her famously tactful way, convinced me to pluck my uni-brow in order to enhance my appearance (I am forever indebted to you, Jess). These moments would include Alumni Weekends when Harvard Basketball’s present meets its past, the many extraordinary former players always willing to lend counsel to players like me that did not have the slightest clue about the “real” world (this counsel is ongoing!) I share this Induction with the Gelmans, the Reinhards, the Proudfits, the Butlers, the Blacks, and the other families that embraced me and shared the same passion for our Harvard Basketball Family. My four years at Harvard were life-changing and self-defining. It was the unique opportunity to study in a diverse and culturally-rich academic environment while learning the true meaning of leadership and what it means to be a part of a team. I am sincerely thankful to Kathy Delaney-Smith, Trisha Brown ’87, and the entire coaching staff for allowing me to play a role in Harvard Basketball’s rich tradition. Kathy, like my mother, is very much responsible for me being the woman that I am today. I am forever grateful to my high-school coach, Sue Misenheimer, for her love and guidance and for treating me as if I were her own. I would also like to offer my sincere gratitude to my aunt and uncle Marshall and Ken Feaster and my cousins Rique, Shannon, Alexys, and Keni for introducing me and my siblings to a new world and for challenging us to strive for excellence. There are no words to describe the important role that my husband and partner Danny Strong has played throughout these past 20 years. He challenges me to be the best that I can be. He and our daughter Sarah, as well as my parents Sandra and Reginald Booker, are my foundation, and I give thanks for them every day. Thank you again for this prestigious honor.